Out of the possible five days of Comic Con, I squeezed in two nights and one full weekend day. As a non-comic book reader and a person who has no cable, many of the people, panels and subject matter did not impress. The overstimulation only over took me once while I was in the exhibit hall, I immediately darted for the nearest exit to get some space. I’m pretty sure I passed by the entire cast of Community and maybe another movie star, but really I have no idea. Here are a few pictures from the exhibit hall that really made me smile. Steampunk was in full effect. If you are unaware of what steampunk is, check out the Urban Dictionary before proceeding. 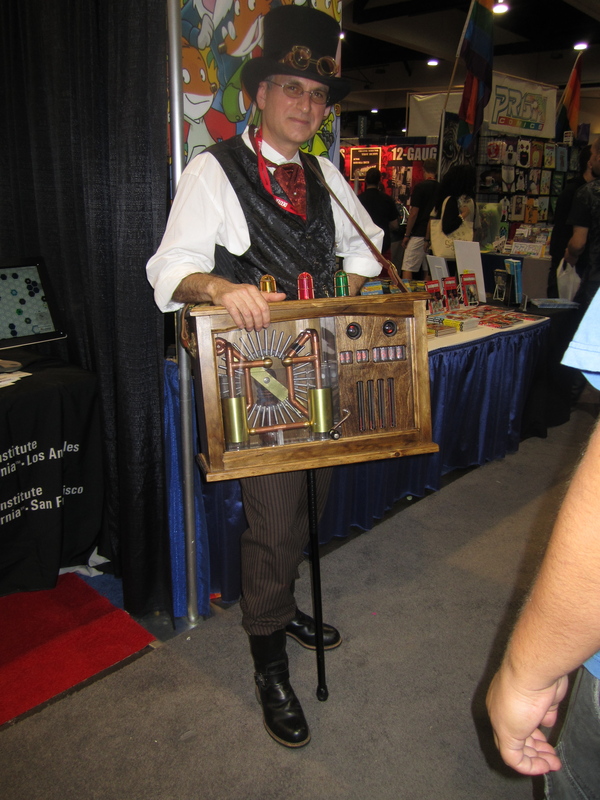 This guy made his own time machine… but not steam-powered, human-powered with a hand crank, similar to an organ grinder. He really just needed a monkey. So I managed to squeeze out of Comic Con with only purchasing one thing (well… really two things as a bought a Gama Go shirt for Roger) As I was meandering through the exhibit hall, a book about classic Hanna-Barbera caught my eye. Colorful images of old cartoon cells, storyboards and merchandise popped from the pages. The vendor shared that the author, Jerry Beck was standing nearby and that they were doing a signing at 2pm. I shared that I would be standing in line at that time for Ray Bradbury’s session. This prompted a full conversation about Ray Bradbury and his historical influence. 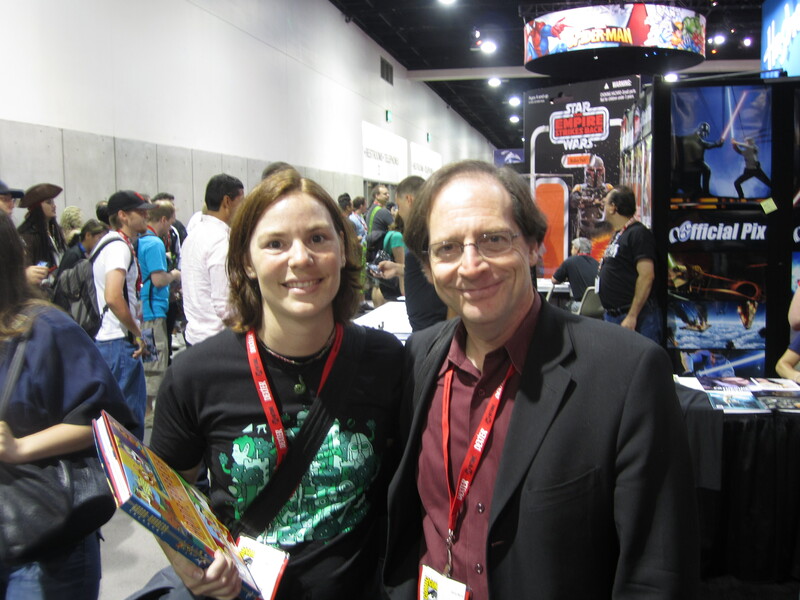 As it turns out Jerry Beck is a cartoon historian and also runs a blog called Cartoon Brew. Take a look. If you enjoy cartoons both old and new, check out his site. It was a pleasure talking to him, if even for a short while. DJ Lance Rock! 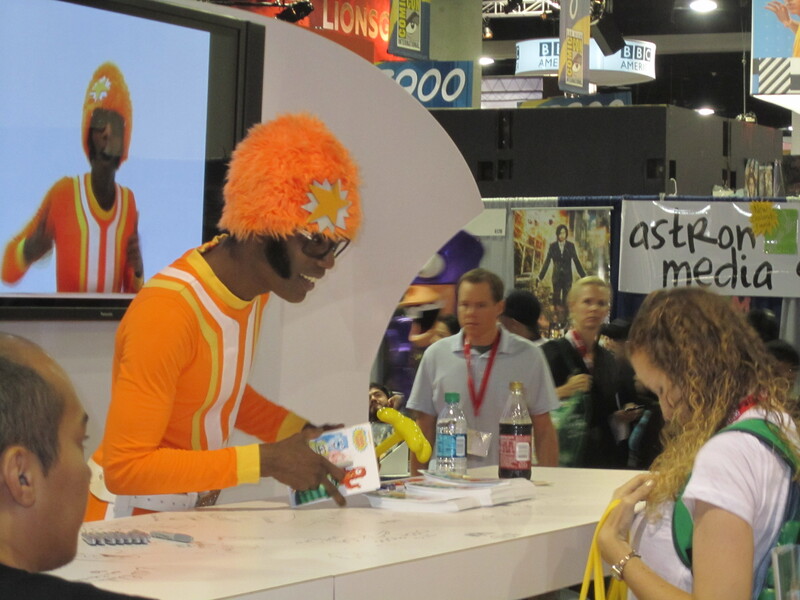 No, I didn’t stand in line for an autograph, but I do have 4th row tickets for Yo Gabba Gabba Live later this year. Whee! Speaking of lines, I was actually over-prepared for standing in lines. Apparently the stuff I cared about, no one else gave a $%!t. Bonus… but I really should have planned better for back up sessions. Next year, if I’m able to go I would like to see the Worst Cartoons Ever session, more Ray Bradbury if he is around, maybe a writing workshop or two, and hit up a Quick Draw session. That really wraps up my Comic Con 2010 experience. Oh, except one more thing… San Diego should remain the home of Comic Con. I know I’m not the only one rooting for its anchoring; just check out what these experts have to say.